First things first, thanks to the publisher and author for an ARC of Master Assassins in exchange for an honest review. This is no way, shape, or form sways my judgement of the book itself. A lot of people have stated that the cover does not do the book justice, and I have to agree. I am not saying that the cover isn’t great, because I believe it is wonderful, but it does not fully capture all that is contained in the subsequent 458 pages. I also have to agree with Rothfuss that this book has EVERYTHING: murder, intrigue, monsters, magic, world-building, beautiful landscapes… I could go on and on. 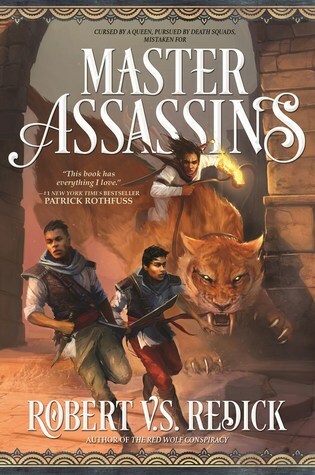 Though it is only April 6th, and there are many books left to read this year, Master Assassins has cemented itself in AT LEAST my top 3 books of the year, maybe even #1. It is that good. Kandri and Mektu, half-brothers and as different from one another as can be, are the main focus of the story. Although their relationship is convoluted and fraught with controversy, they must rely on one another when holy blood is spilled and they are the ones caught in the cross hairs. They are chased out from their village into the desert known as the ‘Land that Eats Men’, where catching a cold or being bitten by a sun spider are the least of their worries, and must use their wits (along with some interesting allies they meet along the way) in order to survive the Prophet’s death squads that are nipping at their heels. What they aren’t aware of is that they hold a secret that can change the way of life in Urrath forever. Kandri and Mektu’s relationship is what really shines through in this novel. Not only do we progress with them through their current predicament, and it is a heck of a predicament, but we are given a glimpse into their shared past, including love interests, upbringing, and the interesting relationship they had with their secretive father. Redick does a great job of blending the two timelines together seamlessly, almost to the point where you can’t tell when the timelines switch. Also, Kandri’s ability to take everything thrown at him with gusto, mixed with Mektu’s inability to shut his mouth or follow orders, generally led to some quite humorous moments, as well as some “how do they get out of this pickle” confrontations. Redick has also given the pair a great support cast, including some strong female characters that tended to, more often then not, put Kandri and Mektu in their respective places. The world-building, including landscapes, cultural practices, and weaponry gives us a fresh take on the genre as a whole and gave me a, though I didn’t know it at the time, palate cleanser from my normal grimdark view of fantasy. I recommend Master Assassins to everyone. Period. Unless sexual innuendo, language, or a tiny bit of violence make you head for the door, go grab a copy and don’t turn back. This sounds awesome. Adding it to my wishlist.